Hello! 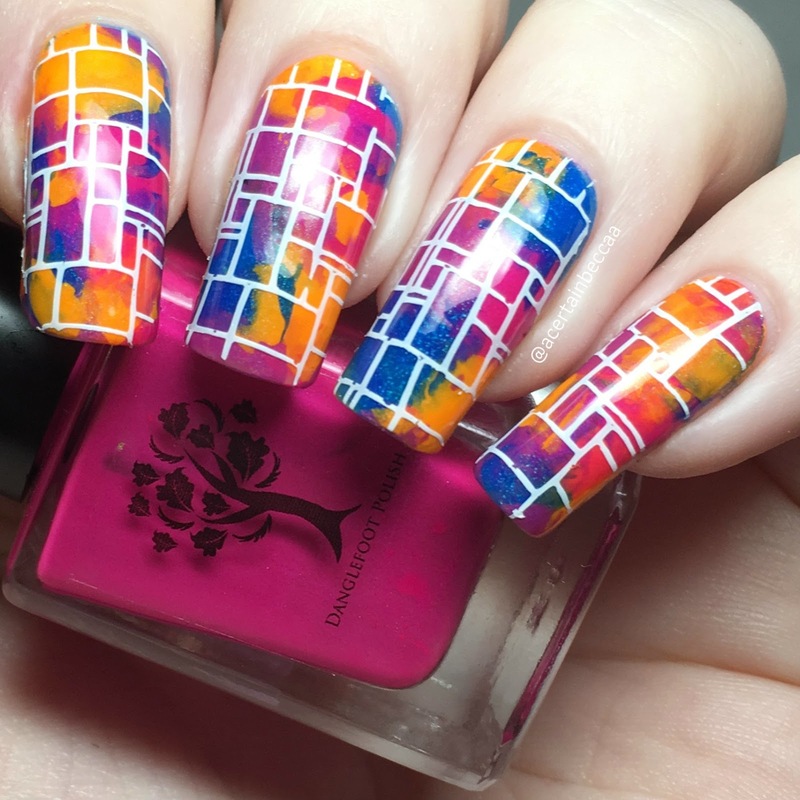 Today I'm back with yet more nail art using the Danglefoot Nail Polish neons. If you missed my initial swatches of the four polishes, you can find those here. 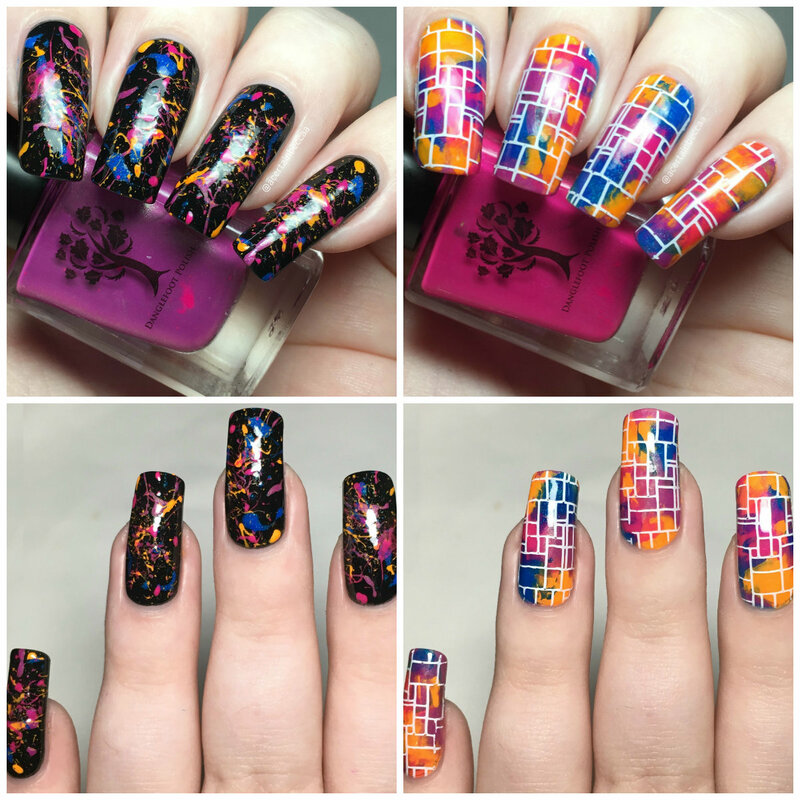 If you missed the four nail art looks I shared in my last post, you can see them here. This time I went for two messier techniques. Read on to see both in full and for more info! First up is a splatter mani! 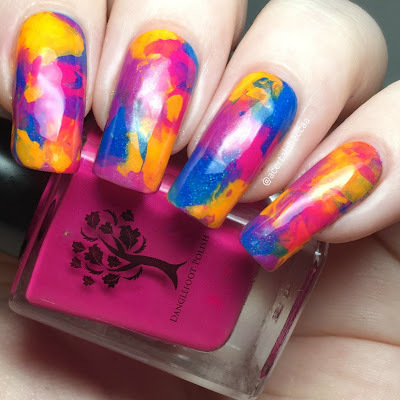 I always love doing splatters, especially the old fashioned way with several polishes, straws, and a lot of mess! 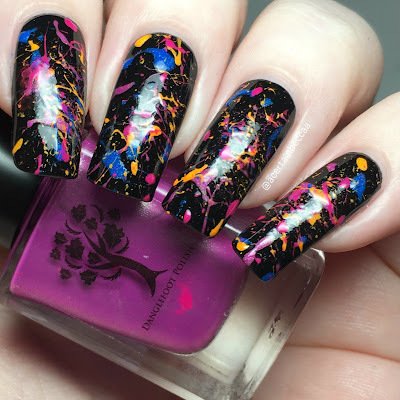 I splattered all four of the neons over a black base (Mavala 'Black' from April's MeeBox, swatched here). Next I decided on a smoosh. Again, I used all four neons. Instead of using a sponge like I usually do, I attempted a smoosh using a stamper head. It seemed to give a bit less of a 'blended' smoosh than sponging, although that may just be the contrast of the neons. I couldn't leave my smooshed base plain. 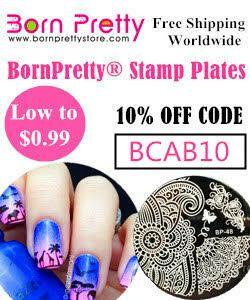 I stamped over the top using Hit The Bottle 'Snowed In' and a geometric pattern on UberChic Beauty stamping plate 9-03. What do you think? They're definitely both 'in your face' manis, but that's what I love about them! I've had so much fun playing with Hayley's neon quartet, but sadly it's time to stop spamming you all with them and get round to some of the other polishes waiting for me in my swatch pile. I can't promise this is the last you'll see of them though!